Location: You will find this popular attraction at Pixar Place in Disney’s Hollywood Studios. 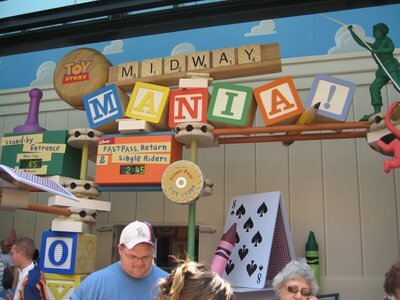 Description: During this ride you will be introduced to several 3D carnival style games hosted by your favorite characters from Toy Story. Board a continuously loading ride vehicle that holds up to four passengers to embark on your 5 and a half minute journey! You will have on board,two toy guns which allow you to participate in the games. As the story line goes, you the guest, have been shrunk down to the size of the toy to play with Andy’s new carnival game. You will play classic carnival games such as tossing baseballs, rings, eggs, pies and darts. You are on a mission to collect as many points as you can! The game is fun for the entire family and you will want to line up over and over again to beat your score. You will will get to wear 3D glasses to experience this attraction. 1. This attraction is EXTREMELY popular. If you plan on riding you must head to this ride as soon as you arrive in the park. Fastpass is highly recommended. 3. Each day guests break over a million plates with their on board shooters! 4. You will have 30 seconds in each game area so get ready to aim and fire! 5. Make sure you check out Mr. Potato head while waiting in line. He is the most detailed audio animatronic on property and can interact with guest and remove body parts! This entry was posted in Attraction Spotlight, Hollywood Studios, Pixar Place. Bookmark the permalink. ← Be our Guest Restaurant Opening!